The lectures revolve round the crucial importance of loving kindness or Karuna, the most worth cultivating state of mind in Buddhism. The first lecture traces the development of the concept to show its relevance for our own times. The idea was first germinated in a celebrated Pali sutta, and later epitomized by Asanga, the Yogacara philosopher. He asked what would happen if we did not have loving kindness in our hearts, if the attitude of love is lacking, without love what follows? The answer given rings true for all of us today: we become defenceless against its opposing tendencies like malice, violence, jealousy and prejudice. These destroy oneself and destroy others, destroy morality. The second lecture compares the idea of pride as in the Bodhicaryavatara with that in The Imitation of Christ, and brings out the convergence of thought in the two classic texts. The third lecture investigates the role of emotions in respect of the idea of the perfected man. 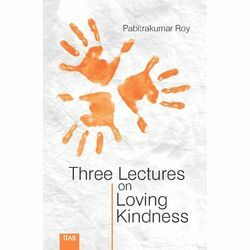 The lectures are prefaced by an essay on the theme of liberation through loving kindness or ceto vimutti as the Pali adage goes.